The history contained here is complied from letters by Elizabeth Kelley, Msgr. Arthur MacDonald, and documents in the Diocesan archives. 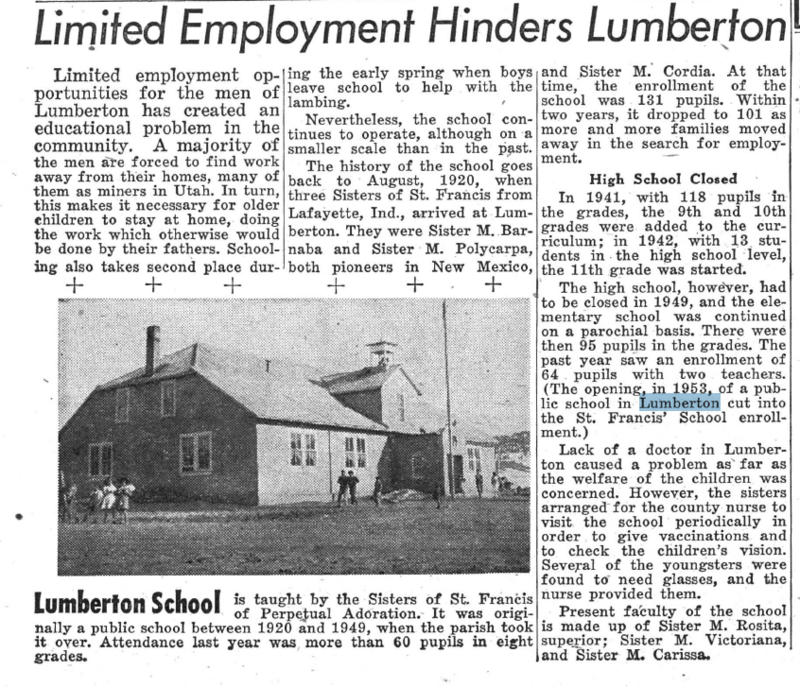 The parish of Lumberton began as a mission of the parish of Parkview (a village then known as Los Ojos, near the Chama river), around or before 1900. When the first church was built at Lumberton and dedicated to Saint Francis of Assisi between 1900 and 1907, Father Antonio Jouvenzeau was the pastor at Parkview. Besides Lumberton, he had the care of a large number of churches in the area, extending as far west as Farmington. On September 13, 1910, the Franciscan Fathers from Sacred Heart church in Farmington took over the missions including Lumberton. By 1915, priests were in residence and the mission became a parish in 1919, with Father Sixtus Kopp, OFM, as the first pastor. The parish remained under the care of the Franciscans until 1981, when Diocesan priests were assigned. A grade school was established in 1920. The Sisters who had come to teach in the Lumberton public schools in 1919 took responsibility for the parochial school when it was built. In time a high school was added, but due to dwindling population, this was later closed. On Christmas Eve in the late 1920s the interior of the church was destroyed by fire. The undamaged walls were used in rebuilding the church. Story from the New Mexico register. Through the years, necessary repairs were made to the church and the attractive adobe church with its beautiful stained glass windows is still in use. Other construction efforts have involved a convent and a new school building. When Lumberton first became a parish, it had under its care many small missions on both sides of the Colorado border. 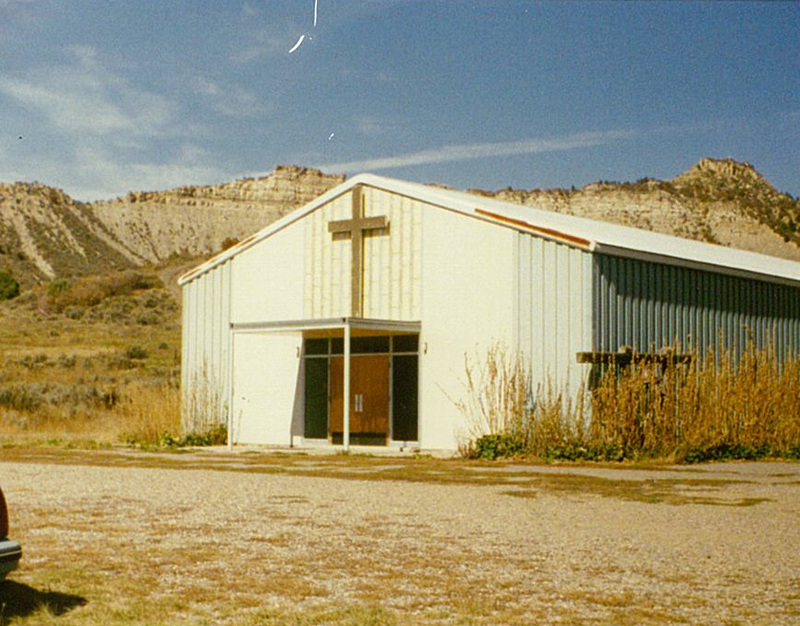 Later many of these were abandoned because of fewer people living in the area or taken over by the Pueblo, Colorado Diocese. In 1946 priests began holding services at Dulce, an Apache community three miles away. In time, it became necessary to construct a Church for the many people there, and on October 3, 1965, the chapel to Saint Anthony was dedicated. The bells from one of the abandoned missions were installed there. With the funds obtained through a grant by the Catholic Extension Society, the church was completed in 1966. In 1987, Father Arthur MacDonald (now Monsignor MacDonald) wrote a reflection on the culture of the two villages. Dulce is the “Window Rock” of the Jicarilla Apache people. It is a comparatively new community; the people were encouraged in the 60’s to leave the rural part of the reservation and settle in town so that the back country could be developed as oil producing country. Only tribal members and those married to tribal members may live in Dulce. The tribe allows BIA people, school employees, medical and church people to live there also. Population – 2200. Many of the Jicarilla people have married members of other tribes; some have married Spanish and Anglo. In the parish these tribes are represented: santa ana, Taos, Zia, Jemez, Navajo, Zuni, Santo Domingo, Papago, Sioux, Mescalero Apache, Santa Clara and San Juan. There is no elaborate ceremonial life among the Jicarilla Apaches as there is with the Navajos and Pueblo people. The initial teenage feast for girls is the most common and about the only one that has religious significance. The fall festival called “Go-Jee-ya” is a four day gathering of the tribe out at Stone Lake – mainly social and athletic. This is the year of centennial for the Jicarilla people. They are celebrating the establishment of the reservation in 1887. This celebration would seem to indicate that they are happy to have a “homeland” where they are protected, for the most part, from outside intrusion (the National Review article contradicts this concept). The Jicarilla people also celebrate the event of a great revival or comeback in the area of survival. In the twenties, the tribe was decimated by tuberculosis. Only six hundred people were left. The Presbyterian church people provided all kinds of help to stop this threat of disease. Medical personnel were brought in and did heroic work. 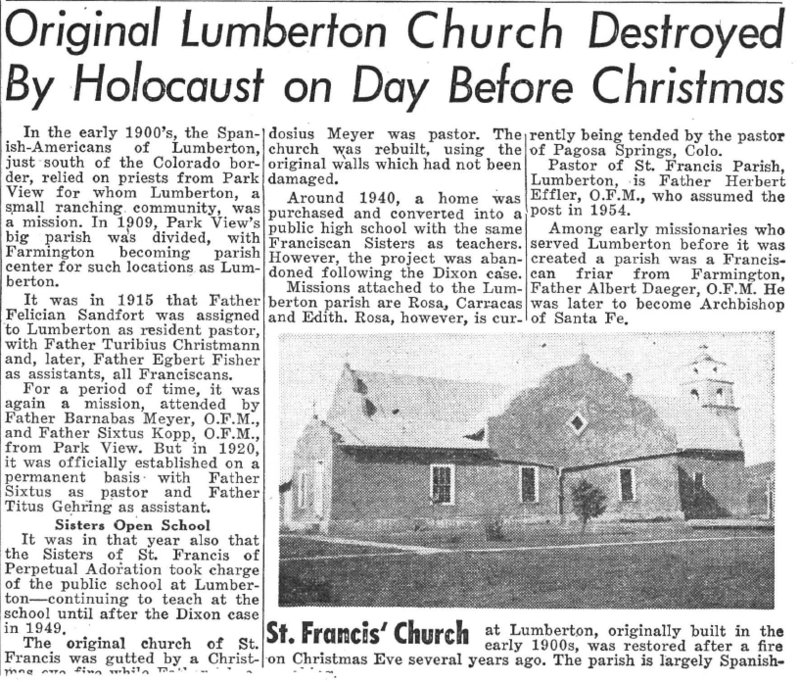 At one time Lumberton was the dominant Catholic community. Today there are a little over a hundred, most of whom are Spanish, few of whom practice their faith. When the population shift to Dulce took place, Father Connal Lynch used some money that Mother Drexel had left for work with the Jicarillas and got a church started. Little by little the people began to send their children to the Lumberton school; they had great respect for the padres and the nuns. Today the school has about 55 Native American students and fifteen Spanish. It is a great way to reach non-Catholic families and maintain a good relationship between the church and the tribe. Father Wilson did much to break the final control of a remnant who, from the old days, were still trying to run the parish and the school. He did a lot to return the parish to the people who had felt alienated and excluded. He visited homes of people who had been away from church for decades and brought many back in a short time. The Penitente presence in the area among the old Spanish men is very quiet yet powerful because of their prayer and penance. Their morada is six miles north almost on the Colorado border. One final thing, there is a Blessed Kateri shrine fund, set up by a Protestant lady of an Oklahoma tribe; she lives in Dulce – Thaymus Vigil. She donated 25000 in 1981 – it has grown to forty thousand. She feels that now is not the time to build the shrine and I always respected her opinion. I would like to share with you some observations about the people of Lumberton-Dulce and the school for Indian children of the Jicarilla Apache tribe. There are six grades in the school. The children come by way of the parish school bus which the pastor drives each day, morning and evening. There are four classrooms and a gymnasium and a fine library. There is also one room for special reading equipment and audio-visual use. The gymnasium is used for intramural sports and for daily recreation when the weather outside is inclement. Mrs. Della Talamante comes in every day from Colorado (six miles away) to prepare a delicious hot lunch for the children, many of whom come to school without breakfast. The government helps to subsidize the lunch program. In the course of a school year over twelve thousand lunches are served. These other volunteer teachers arrive as newcomers each year and leave at the end of the year. This has been the situation. In addition, a man for coaching and maintenance is usually on the staff. The children are Apache Indian for the most part but there are also seven of the Pueblo Indian Tribes represented. The pueblo children are Catholic; only a few of the Apache are Catholic. There are also a few Spanish-American children. The enrollment is a maximum of 72. Story from the New Mexico Register, 1955. All children are from English speaking families but with many, English is their second language. This means that the school has to concentrate on the verbal skills of reading, writing, spelling and speaking. These are the main tools for handling the other studies. Among the Apache people of the Jicarilla Reservation there is very little unemployment. The tribe is very good at creating jobs for its members. Oftentimes the non-Indians of the region do the menial jobs and the Indians handle the office and clerical work. The housing is quite good; there are some sub-standard residences but they are disappearing little by little. If it appears that a family is poverty-stricken, one can be quite sure that it is a result of alcoholism with the consequent mismanagement of income. The school gives one an opportunity to know the family background more than one ordinarily could in an Indian-dominated community. One listens and says very little; after a time, one learns much about the families. We avoid the “anglo” habit of asking a lot of direct questions. This would apply especially in the matter of family relationships. They are computed and named in a different way than we know – something like the use of the term “brothers and sisters” in Our Lord’s day. The Apache people, while not very Catholic either in numbers or belief, do have a great respect for the women religious. They have always associated them with work of fine education, especially in the Lumberton-Dulce area where the Catholic School has been presented for over 65 years. They are proud to have their children going to the Catholic School. The discontinuation of a rail line through the area and a general lack of employment caused the population of Lumberton to shrink a great deal. Today, the village of Dulce is larger and more active. However, the parish seat remains in Lumberton and the school that has served the Native Americans of Dulce since its origin 70 years ago continues to function.